Newly submitted renderings of Apple's proposed 13,000-employee mega-campus in Cupertino, Calif., depict a roof with a dark-grey material, a jogging path and modest changes to the ancillary fitness center. The City of Cupertino posted an update to the company's "Apple Campus 2 Project" on Tuesday evening. Though most of the new renderings are higher-quality, better-lit versions of the original design, some of the images also appear to show a darker color for the structure's roof. Other minor changes in the revised application include the addition of parking plans for the corporate auditorium, drawings for a private jogging path and a proposed expansion of the corporate fitness center from the original proposal of 25,000 square feet to 45,000 square feet. The fitness center appears to have lost a floor in the process, as the new submittal lists the facility's height as 18 feet instead of the original 30 feet. Late Apple co-founder Steve Jobs first unveiled the project at a Cupertino town hall meeting in June. The 2.8 million square-foot office building, which would boast a wider diameter than the Pentagon, would house 13,000 employees. 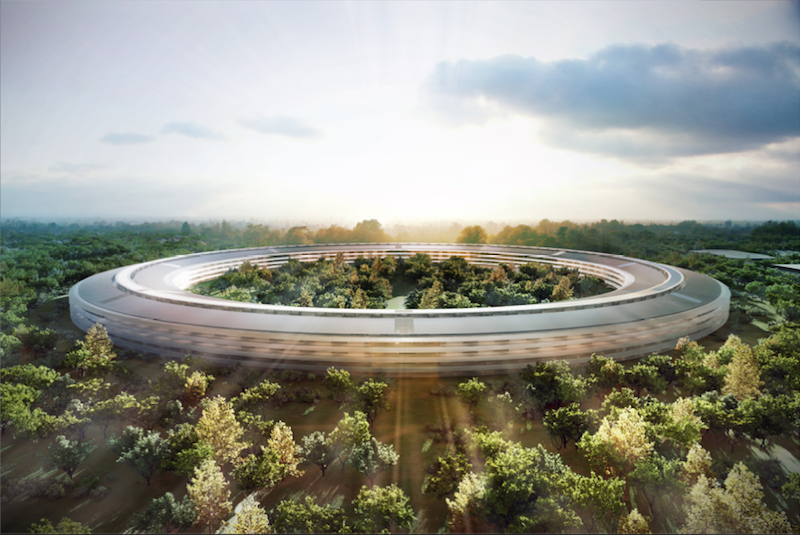 "It's a little like a spaceship landed," Jobs said of the building, which has a circular shape with curved glass all the way around. 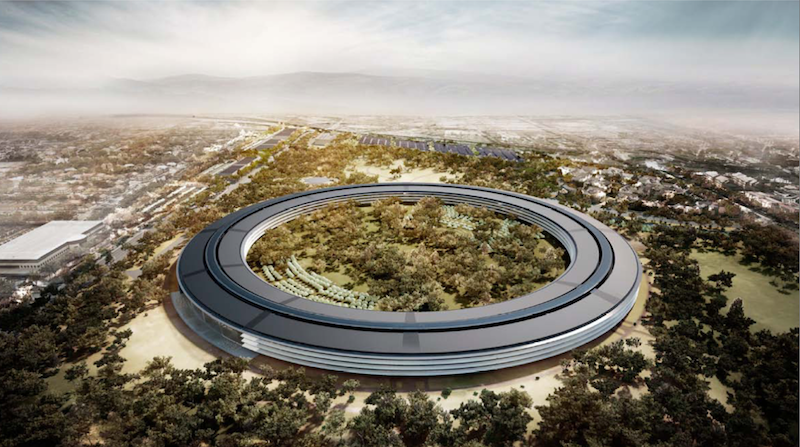 According to him, Apple has "a shot at building the best office building in the world." Original rendering, left; Updated rendering, right. However, some critics have taken issue with Apple's design choices. The Los Angeles Times architecture critic has called the project a "retrograde cocoon," disparaging it for an eclectic mixture of a "futuristic gleam" with a "doggedly old-fashioned proposal." The New Yorker's architecture critic lampooned the building as "a gigantic donut." He described the project as "troubling" and "maybe even a bit scary," because it lacks functionality and human scale. Following Jobs' presentation, city officials quickly voiced support for the project. Cupertino mayor Gilbert Wong said there was "no chance" the city would not approve the structure. Mayors of neighboring cities have also come out in favor of the project. 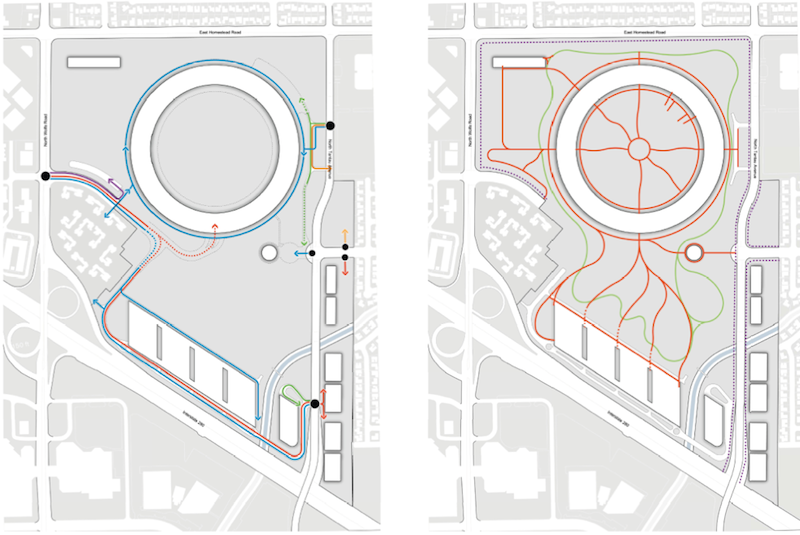 Proposed vehicle circulation, left; Proposed pedestrian circulation, right. Assuming that Apple receives the necessary approvals, the company plans to break ground on the project next year and open the facility in 2015. The iPhone maker appears to have already budgeted increased capital expenses for the structure, as its projected expenses for fiscal 2012 have jumped up 72 percent year over year.